In a bowl, combine all ingredients. Using your hands, press mixture onto the bottom part of cheesecake pan. Combine soft cheese , sugar and flour. Mix at medium speed until well blended . Add eggs . Blend in vanilla. Please be mindful not to over mix. Pour half mixture on top of crust. Drizzle half the chocolate on top. Pour in remaining batter . Drizzle the rest of the chocolate over top of batter . With a long wooden skewer or a knife , make 3 big figure 8 patterns through chocolate and batter carefully minding not to scrape the crust. Run a knife around sides of pan to loosen the cake. Remove the outer circle of the springloaded pan. Cool for 2 hours at room temp. Refrigerate for at least 2 hours before serving. 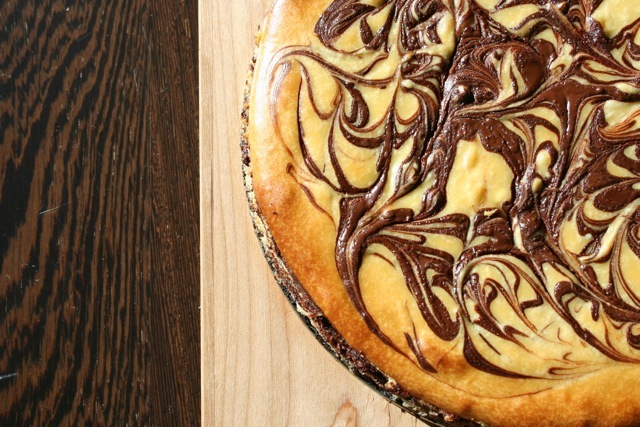 This entry was posted on Wednesday, February 1st, 2012 at 1:23 am	and tagged with Cheesecake, cream cheese, dark chocolate, desert, gram cracker crust, Marble Cheesecake, recipe and posted in Category. You can follow any responses to this entry through the RSS 2.0 feed.